In a quiet pocket of far west Arlington, nestled high on a hill surrounded by a grove of stately trees, is Arlington Baptist University. The location for this tiny outpost of higher education is both perfect and improbable: The campus is pretty and pastoral, with stunning views; yet it’s also situated along a stretch of Division Street (formerly the historic Bankhead Highway) that’s best known for no-frills diners and storied dive bars; many have also traveled this road to see Lee Harvey Oswald’s grave, located about five minutes down the road on the Arlington-Fort Worth border. In the 1920s, when alcohol sales were banned in the U.S. during the era known as Prohibition, a couple named Fred and Mary Browning purchased the Top O’ Hill property, then home to a tea room and restaurant. The new owners continued operating the tea room, but unbeknownst to many unsuspecting patrons (not to mention local residents), the Brownings also opened up a swanky off-the-grid gaming facility that quickly began drawing gamblers visiting the nearby Arlington Downs racetrack. As word spread, gamblers, bootleggers and other colorful figures from Texas and beyond became regular patrons at Top O’Hill. For a while, Fred Browning’s illegal hilltop operation managed to operate under the radar. Eventually, however, the goings-on came to the attention of law enforcement and clean-living crusaders, particularly Dr. J. Frank Norris, a Fort Worth evangelist who was as well known for controversy as he was his fiery radio sermons. The party at Top O’ Hill finally came to an end shortly after World War II, following a successful raid by the Texas Rangers. In 1956, the property was purchased by the Bible Baptist Seminary, a forerunner of Arlington Baptist University. Fortunately for history’s sake, Arlington Baptist University has chosen to preserve the site’s historical structures, many of which still exist today. One: The Top O’Hill gang had some pretty slick moves when it came to dodging the law. Initially, Top O’Hill’s gaming operation took place inside the main house where the Brownings lived. As word spread and things got crowded, Fred Browning moved the house over a bit and constructed a custom-built basement, complete with secret exits, that could double as a casino. Once the basement was ready, he then had the main house moved back on top of it, thus contributing to the illusion that Top O’Hill was just another unremarkable and legitimate business. Casino operators engaged in elaborate trickery to stay out of trouble, using ruses like moveable walls that could be flipped around to hide roulette wheels and gaming tables that turned over to reveal glued-on plates and silverware. Posted lookouts took advantage of the property’s sweeping views to alert the bosses about approaching law enforcement. By the time the law-and-order types got to the top of the hill, the patrons had vanished (see below) and the workers were seated at card-free, dice-free tables, singing hymns or striking other virtuous poses. Two: Top O’ Hill also has underground tunnels that still exist today. Another tactic the casino used to stay one step ahead of the law was a 50-foot underground concrete tunnel that spilled out into a dense grove of trees on the property’s west side. Fun Fact: More underground escape routes were detected by radar when The History Channel’s “Lone Star Restoration” show visited the property in 2016. Three: More than one A-list celeb paid a visit to the casino in its heyday. According to Top O’ Hill historians and local legend, some of the casino’s more famous visitors included Marlene Dietrich, Will Rogers, Mae West and John Wayne, as well as high-profile gangsters like Bugsy Siegel, Bonnie Parker, and Clyde Barrow. Four: Back in the day, the property also boasted a swimming pool, a boxing facility and stables. Owner Fred Browning installed an 18 by 50 foot swimming pool (considered large by the standards of the day) that featured three diving boards! Professional boxers who trained at Browning’s mini-gym and sparring facility could often be spotted swimming post-workout laps. Top O’ Hill was also home to the deluxe stable for Royal Ford, a prizewinning racehorse whose offspring would go on to beat Seabiscuit. Five: Top O’Hill was so glamorous it even had air conditioning. Although air conditioning was a rarity in pre-war America, Top O’Hill had a large, evaporative cooling system that connected to the main house by a hose that ran through an underground tunnel. The building that housed the air conditioning unit is still in existence today. Six: Visitors to Top O’ Hill Terrace come from all over the world. According to curator Vickie Bryant, recent visitors have come from as far away as Guam, Japan, the Philippines, Spain, and Vietnam. But you don’t have to be an international tourist to experience Top O’ Hill: Tours are available by appointment for Arlington visitors and locals alike, and according to the website, “no group is too small” to accommodate. The suggested donation for a tour is $10 a person. Find out more about Top O’ Hill tours. Seven: There’s a fundraising campaign underway to save the tea garden. 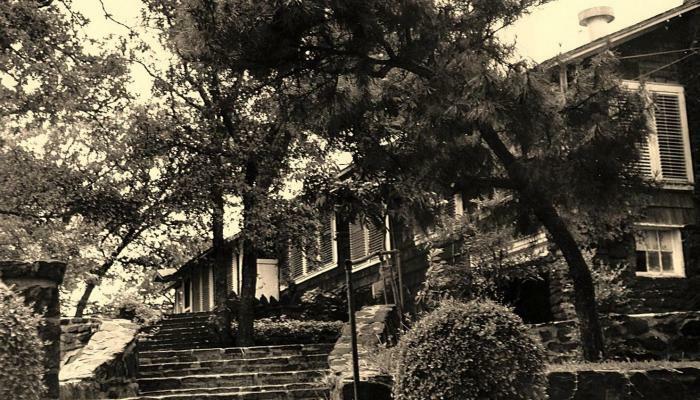 The effects of weather, the passage of years, and area construction have caused the property’s west hillside to crumble significantly, which in turn threatens the immediate preservation of the Top O’Hill’s tea garden. If you’d like to make a donation to support Top O’ Hill’s restoration efforts, visit the property’s GoFundMe campaign page here.